Do you believe in magic? Well Rangers fans probably do after The Rangers somehow managed to fit the salaries of two of the biggest free-agents under cap-constraints. After failing all spring to come to terms with Michael Nylander the Rangers started off the summer of free agency with a bang, a big bang. The blue-shirts went out and signed both Chris Drury and Scott Gomez to long-term deals Sunday doing what many in the sport thought was impossible. With Drury and Gomez now on the team the Rangers will enjoy a core of players which should make them competitive immediately and for years to come. At least immediately the Rangers will boast an offense which also has Jaromir Jagr, Martin Straka, Brendan Shanahan, and Sean Avery which means scoring on the power-play should be the least of their concerns. What will concern the Rangers the rest of the summer is going to be how they can fit the rest of the restricted free agents and Shanahan under the cap. 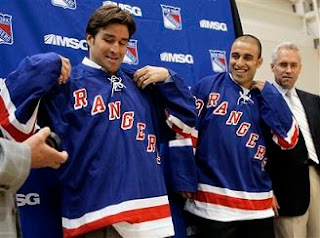 The Rangers gave Chris Drury a five-year $35.25 million deal and Scott Gomez a seven-year $51.5 million deal. That puts them at a $38 million already spent on a payroll than cannot exceed $50.3 million. This leaves them with about $12 million to spend on Henrik Lundqvist, Shanahan, Petr Prucha, Sean Avery, and Marcel Hossa. Next year the coach Tom Renney will likely send out a first line of Jagr-Gomez-Straka. Gomez would be paired with Jagr likely because of his ability to get the puck to the captain as opposed to Drury’s propensity to score goals, which would make him a good line-mate for Jagr on the power-play. That would leave Drury to be paired up with Shanahan and Avery, Prucha, or Hossa on a second line which certainly should be able to light-up the garden. Combine the offensive fire-power the Rangers now possess with Lundqvist and a blue-line crew who will add the OHL’s Most Outstanding Defenseman for the 06/07 season Marc Staal and you should get a team ready to go deep into the playoffs. The Rangers did see some subtraction to their roster as the Nashville Predators signed forward Jed Ortmeyer to a two-year $1.5 million deal announced yesterday. This is of course in addition to the loose of Nylander who was determined to give free-agency a shot.